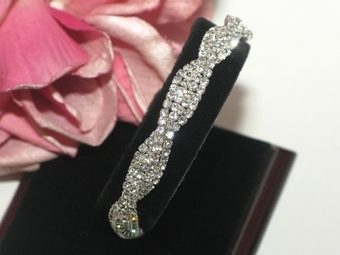 Cassidy- Elegant Rhinestone Bridesmaids or Bridal Bracelet - SPECIAL!! HOME / BRIDAL JEWELRY / Wedding Bracelets / Cassidy- Elegant Rhinestone Bridesmaids or Bridal Bracelet - SPECIAL!! Description: New Simple and Elegant Bridal Rhinestone Bracelet. very pretty design, perfect for bridesmaids or for the bride who just wants a little touch of sparkle and elegance. extention included fits small to average wrist. Measures approximately 1" wide fits standard wrist size, magnet front closure.